A compact SUV should combine the capability of a full-size SUV with the easy handling of a car, and the 2017 Honda CR-V does that and more. Notoriously picky automotive reviewers have been singing its praises, noting its exciting engine and generous safety features. Honda has long been known for their commitment to modern technology, and the CR-V includes all the latest high tech connectivity and convenience systems across its four distinctive trim levels. Let’s take a look at just how well equipped this small SUV is in the area of technology features. All trim levels of the CR-V include a rearview camera. It shows the area behind the vehicle to make it easy to back up and parallel park. On the EX trim level and above, this feature lets you access your vehicle without removing your key from your pocket. It even locks it automatically as well. 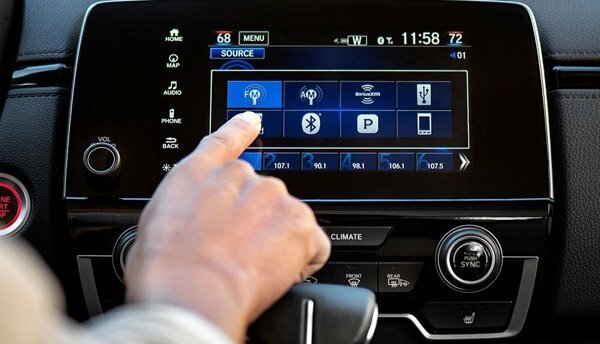 This upgraded infotainment system is included in the EX trim and above, and advanced touchscreen controls make it easy to use. In the luxurious Touring trim, you’ll find a satellite-linked navigation system, which provides accurate, up-to-date directions, lane guidance, and traffic alerts. The CR-V includes a number of connectivity features, which are standard with the EX trim level and above. Apple CarPlay, Android Auto, SiriusXM Radio, and more are all included. There are also a number of advanced audio systems available, and the top of the line Touring trim includes nine premium speakers and a powerful subwoofer. In addition, the EX trim level and above features the Honda Sensing package of active safety features. It includes lane keeping assistance, dynamic cruise control, collision prevention braking, and road departure prevention. It’s an important feature for Elgin drivers looking for nothing but the best in safety. Here at Brilliance Honda of Crystal Lake, we believe the best way to experience the Honda CR-V is to get behind the wheel. Our sales team is happy to show off the full range of family-friendly CR-V models, and you can even schedule a test drive online. Be sure to visit our showroom in person at 680 W. Terra Cotta Ave., just a short drive from Elgin, IL. Experience the high tech CR-V today!